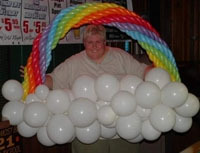 Child Entertainer in San Jose California - Twistin' Shout BALLOONS! Twistin' Shout BALLOONS! is a women-owned and operated business that has been serving the San Francisco Bay Area and beyond since 1997. We have won numerous awards for our art. We love what we do - and it shows!